After his first training session in heaven, George Best, from his favourite right wing, turned the head of God who was filling in at left-back. I would love him to save me a place in his team - George Best that is, not God. 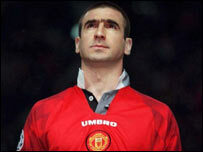 Eric Cantona's interesting tribute to George Best. George Best invented rock 'n' roll football. Former France and Juventus midfield great Michel Platini. He carried us for years, it was an honour to carry him. Best's former Northern Ireland team-mate Derek Dougan - one of the pall-bearers at the football legend's funeral. Georgie Best was everywhere, with Elvis hips and Beatles hair - a real wizard on the ball, he was the greatest of them all. Poem on a floral tribute at Old Trafford. Just imagine what would happen if he went to Barcelona with Ronaldino and Samuel Eto'o! David Beckham would rather see Thierry Henry at Real Madrid than their arch-rivals. Wayne's like my son, Brooklyn, who goes out in the garden to play and have fun. Beckham compares Wayne Rooney to his six-year-old boy. Wonder if they share the same taste in reading material as well? Peter Crouch upon learning his first strike for Liverpool could be credited as an own-goal by Wigan keeper Mike Pollitt. Are we the new Surrey? Paul Collingwood on the three Durham players in the England side. Durham fans will be hoping not, after Surrey were relegated this year. I'm looking forward to pitting my wits against Mourinho, but I'll need a new coat and a new suit before I go! Huddersfield boss Peter Jackson, whose side face Chelsea in the FA Cup third round. I let my lads off training on Friday and took them ten-pin bowling instead because they were a bit tense. It turned out to be pure genius! QPR boss Ian Holloway reveals the secret to his side's first win in six at Stoke. It's nice, but 64 is not going to put him on the Wheaties box or whatever your favourite cereal is here, so he is going to have to make progress and I suggest he will. John McEnroe predicts Andy Murray can be a cereal thriller. 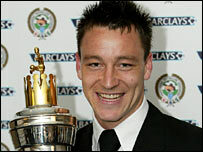 Did Terry win virtual player of the year as well? You can choose your own team but not everyone is Chelsea. A few lads have swerved to be Barcelona. It will upset the neighbours but I'll pop some chocolates through their doors afterwards. Chelsea Captain John Terry looks forward to hosting an evening of virtual football game Pro Evolution Soccer for his team-mates. I am realistic and by the time he is old enough to go to fights hopefully I will be sat in my armchair with the pipe and slippers. Boxer Ricky Hatton, who does not like his five-year-old son Campbell watching his fights live in case he "gets flattened". Maybe the Williams sisters find it difficult to play each other, but maybe they are little bit dramatic because they are Americans. Rachael Grinham on playing her sister, Natalie, in the semi-finals of the World Squash Open. Rachael won the showdown, only to lose to Nicol David in the final.